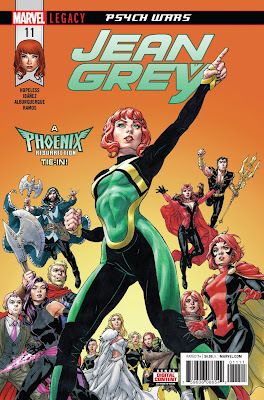 Jo S: A double hit of Jean Grey blazes into my list this week, with the final issue of Phoenix Resurrection partnering up with the new arc of young Jean Grey’s own series. The Phoenix has been imminent throughout the five weeks that the former has been running and the suspense has morphed into feverish anticipation. Hopeless’ series left young Jean just as the Phoenix finally arrived - she has the support of former Phoenix hosts but how will she survive its arrival this time? My other Marvel pick this week is Tales Of Suspense #101: recent renumbering leaves this confusingly labelled #101 (of 5) but I bear no confusion at all over how much I'm looking forward to seeing the Clint and Bucky team-up deepening their investigations into the assassinations of Natasha’s own hit-list; who but the Black Widow could be wiping out her enemies so efficiently? A couple of issue #1s complete my pull: I've been waiting for Si Spurrier’s Motherlands since previewing it and I'm looking forward to seeing how his skill as a creator of other worlds sets off a tale of celebrity bounty hunters and a mother and daughter forced into a strained working relationship. Lastly, I'm very excited to see JLA/Doom Patrol Special #1, not just because it introduces Milkman Man (!) but also because the art is by Aco. Aco is something of an enigma in terms of his background but his entrancing, psychedelic work on the Nick Fury series last year was a real stand-out for me. Matt C: It's one of those 'five week months', as they say in the retail business. Five Wednesdays in one month means one week it'll be slim pickings on the whole (although there's still a truckload of comics coming out) and as such I find myself looking at a Marvel-only haul. Four books in total: Jessica Jones #16, Moon Knight #191, and Punisher: Platoon #5. Jessica Jones is top of the pile: the return of the Purple Man is perhaps the highlight of the series so far, a worthy swansong for Bendis and Gaydos. Moon Knight is a title I need to catch up on, so more on that at a later date. Punisher: Platoon is a decent sequel to Born, although trying to figure out who of the supporting cast is who is a bit of a challenge. Normal multi-publisher service will be resumed next week!